Before I go into this chapter, I want to first apologize to Cecil, and to the reading audience. I have been so focused on the content of these posts that I have not been thoroughly checking on the format. So from here on in you will see spaces between the paragraphs, and who knows, maybe even a picture here and there! Now lets begin. Cecil starts off by saying that, "Like everyone else, you hold images of yourself--quite inaccurate ones--because you carry in your head your idealized self. This is who you think you are or trying to prove that you are. It's as if there are two sides of yourself: the real and the idealized self." He goes on to share some of the things writers have said to him that helped him see the struggle between the real and the ideal and the unspoken response. Although Cecil says that he wouldn't say the above statements are lies, even though they are in parentheses, he considers them I-want-them-to-be true statements. He sees such statements as the idealized self speaking. It's who they want to be, who they work hard to become, but it's not who they really are. He goes on to say, "Some would call that bragging, but I prefer to think of it as wishful or magical thinking." Cecil shares that, "Many writers also carry inside of them bad images of themselves as writers and of their talent. Both might be true--the inflated ideas of ourselves and the less-than-true feelings or words." Here are a few examples he gives. "I'm not much of a writer." "No one will ever want to read anything I write." After reading the above two examples I feel like Cecil has been reading my mind! I can totally relate to those thoughts, and if you're honest with yourself you probably have had those same thoughts at some point too! I was relieved to read Cecil's words of wisdom that said, "When we learn and mature, the real and the idealized (or the real and the negative ideal) gradually move closer together. You learn who you are, which implies self-acceptance. You not only write more authentically, but your writing becomes stronger, more confident, and truer to the person you're becoming." I don't know about you but I like the sound of that ! Cecil presses on with this thought provoking question. Whom do I wish to Please ? That may seem like an easy answer and one I can tell you from my own experience got me in a bit of pickle several years ago. I had an article that needed some editing before submitting for a local magazine that I was involved with. I asked a fellow friend of mine if he would take a look at my article and make any grammar changes. When I received my article back, not only had the grammar been checked, but my article was no longer my own, but rather, had his hand prints, or should I say word prints, all over it! I think that was the first and last time I ever went to him for help. But I didn't want to hurt his feelings so I left my/his article with the changes and submitted it. But Cecil does give the advice that in order "to sell any piece of writing, you have to please an editor or an agent. 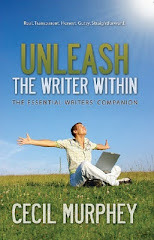 That means your writing can't be self-indulgent and focused on anything that happens to pop into your head." "Discovering your voice is part of the process". He says, "Yet it's more than that. I'm talking about discovering yourself. About learning who you are, accepting who you are, and affirming yourself." After sharing a few true stories, Cecil brings this chapter to a conclusion with some thought provoking questions. He asks, "Do you want to be authentic? If not,close this book. It's not for you. Do you want to present the real you and not settle for the ideal or your fantasized self? It's not an easy task, and it's a lifetime effort." There is so much more good information I could go on and on but I would like to finish with a profound statement that Cecil made at a conference. "When I write, I don't want people to read me and not like me for who I am not; I want people to like me for who I am. They may not like my writing; they may not like the person who wrote, but at least they will have encountered the real me." I don't know about you, but I think that should be a quote to post up on the fridge! Better yet, become the Writer's Pledge ! Thanks for another chapter of wisdom Cecil. Today's Aphorism is: "I may never fully know the real me, but I search for my true self. I learn many lessons on the journey." but I search for my true self. I learn many lessons on the journey."